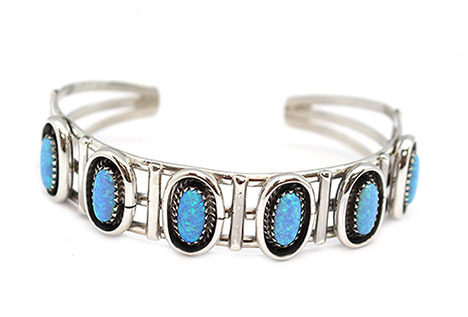 Three shank sterling silver bracelet with six 5x10mm synthetic blue opal stones. Each stone has a twist wire and plain border with an oxidized background. Bracelet measures just over 1/2" wide in the center and tapers down at the ends. Handmade by Navajo artisan Leanderson Yazzie. Currently only this one available and is a 5 3/4" wrist with a 1" opening.